Greetings from ds106! We are in the second week here of the Spring 2013 (yes in Canada, this is a winter semester, sigh) University of Mary Washington course. Last year, the first time through teaching this class in person, I attempted to do audio reflections Ã¡ la the great Scottlo (where is that dude?). That was interesting, but time consuming. So this semester I will start a series of reflections of teaching the class. I already gushed about the first impressions of my students. The first two weeks is something Martha and I coined last semester as “Bootcamp”, where in week 1 and week 2 we focus on all the logistics and setup they should do to be proficient in their blogging and media producing the rest of the semester. I tried a weak housebuilding analogy – week 1 is putting in the framing and foundation; week 2 is painting it and filling in the decoration touches, in in very short time, the neighborhood will not look at all like one of those cookie cutter housing divisions. It’s a lot I throw at them and was even asking myself this week if it is too much. Maybe 6 students dropped (4 new ones added). They get frustrated. One thing I wanted them to do is have a better understanding of their UMW Domains control panel. usually once they set up a domain and install a blog, we never go back there. I hope to interject some tasks through out the semester to have them use other things there (this week I had them set up a forwarding email address). Also in the house building analogy, I am making them set up their ds106 blog as a subdomain- after class, it makes little sense to have this as a primary site. I want them to understand how to create not just one online space, but to know how to do several. I am asking them to install a second copy of wordpress at their primary domain, and throughout the semester to go back and make that one more of a welcome card site (I suggested a few free themes that would work well for that). By Monday when I was reviewing their sites, i could not be more pleased. Blog posts were titles like “phew” “Bootcamp Game Me the Boot” and “Why I Never Fit inside the Computer Science Department”. But after those first sentences, they all pretty much accomplished the set up, the blogging, the media embedding, using categories. Prior to this class, or this week for that matter, I could have swore up and down that I was a rather tech savvy girl. By that, I meant that I was familiar with the better majority of most social networks. From tumblr, to facebook to reddit, I had an account and could probably do a fairly rated tutorial on how to use any one of them. However, in entering this class, I realized that you could never be apart of too many social networks. This just goes to prove what we are doing here in the web presence building is important. Being versatile in using social media sites is a frankly rather shallow skill- there is so much more to making the web than just riding it. They all get comments from me. A lot of comments. Writing hypertext connects readers to related content and helps them understand what you are writing about. Each blog post you write should be understandable as a piece of content on its own. Link to media you are talking about, people, places, concepts, movies, songs, or just randomly connected ideas. A way to test is to ask a friend, family member, random stranger to read it and ask if they understand it. Or read it out loud to yourself. The web is a web because of these connections. I am sure you click links all the time when you browser the web; now you are helping build the web. Make connections. If you do not know how to do this in wordpress, just select the text you want to act as a link, click the link icon, and type/paste in a URL. I will be adamant about this. The things I like are that a lot of them are already writing in their own voices, not the school writing third person dry droll. They are being themselves. Dylan downplays his creativity, but his video story knocked me over. Alice shows some amazing drawing skills, describes her excitement for the class, and shares an interest in a topic not even part of the course. Tiffany totally jumps right into a character voice, watch out for that Fandom Princess. Brooke has completely decked out her blog and has 3 GIFs in her first reflection. Also, most new students love the Daily Create– they all stepped up to do the required one as a video introduction (a few of them need to look up the word “fabricate”!) – see the results, 30 videos so far, at http://tdc.ds106.us/tdc373/. I will do this almost any time I teach online, a simple video prompt that becomes a window to us. A number of students started doing more than was asked, just because they were interested. Somewhere midway through the semester it becomes more of a chore for them, and I watch for that moment to tail it off. The new experiment this semester is also my grand ambition to run a weekly live event, the ds106 show, which is usually going to me wearing something goofy recording a session in Google Hangout. This is not a requirement of students to attend live or even to watch the recordings- this is the extra stuff part community building part connecting part just getting to know each other. Already I have had 4 students each week just showing up to literally.. hangout. IN the first show, it was Nancy who quietly asked, “Why don;t we use reddit? we should have a subreddit!” And now she is going to lead that. Watch it develop at http://reddit.com/r/ds106. The plan is to do this every week, and review what is going on in class. Students are going to be required to sign up to help cohost one session in the next 13 weeks. I also hope to bring in our open participants and guests- already Ben Rimes, Brian Metcalfe have shown up, as well as former student Daniel Zimmerman. It’s wide open. My maybe not so brilliant idea is to overdub the guy in the office with my own dialog. It’s maybe 4 sentences, and kind of fun to rewrite each week. Its taken about 1.5 hours to redo a new one, but that should speed up. It is totally not necessary– yes it is! I thought I could play these through hangout, but it flopped in week 1, so for now I am using the YouTube video editor to combine the trailer and the hangout recording. I am also doing the Bootcamp challenge, again something Martha and I cooked up last semester. it’s part of the ds106 way of having students do some bootstrapping, to figure out that we are not going to give them neat handouts and screencasts of exactly how to do their assignments. In fact, the beauty of ds106 is that we don’t teach software. Students learn it. Last semester I did go around a bit with Lisa Lane on this, in that we run this less structured approach in ds106, that we do not try to guide most steps of the way. In fact, I want my students to struggle a bit. Because lifting them,selves out of a challenge is more than I can teach them by fishing. This week, we’re also going to ask you to do your very first digital storytelling assignment from the ds106 Assignment Bank. The Repository is filled with media assignments that we’ll be using extensively this semester. Your first assignment is “Say it Like the Peanut Butter,” in which you’ll be creating an animated gif of a clip from your favorite (or least favorite) movie. You must also follow the instructions on the assignment page to ensure that your contribution shows up on the Assignment Bank site (this means using the two tags listed in your blog post). I’m not going to tell you how to make an animated GIF. Rather, I expect you to use the tutorials on the assignment page and/or do your own research into how to complete this task (hint also look in the ds106 Handbook). This is a little bootcamp exercise to test your resourcefulness. If you get stuck, should you just spin your wheels alone? No– use your tools (cough… twitter) (cough… #ds106 hashtag) to seek help. Just see what you can learn and do. Do not invest a lot of time perfecting this, I am interested in seeing what you can figure out on your own, and I am not not expecting perfection. Furthermore, I want you to get accustomed to using the Assignment Bank and tagging your submissions properly. So we just ask them to make an animated GIF, and try out their resources available. The point is not to make a GIF. They can get full credit by failing to make the media. The point is to try. To figure out what they don’t know. And what they need to do to fill the gap. And write about the trying. Karissa has a lovely animated Disnet princess though she is learning what happens when she lets wordpress insert a resized GIF (it loses the animation unless you select the original size). And this is what I have come to realize, the primary goal of ds106- it’s not just to create media or web sites, but to become agile in learning how to do that AND being able to write about the process. it is pure learning, high octane. Whew, will this post ever end? I changed up slightly part of the first week’s assignment. Most weeks I will assign a media reading (usually NOT an article) but something to get them thinking about the larger concepts and internet culture. Last semester we started witha few videos and asked the students to reflect on them in their first summary. Before we jump into training, we would like you to start thinking what this course is about. It is about an explosion of creative expression”“ from you. When you watch these videos, pay attention to ideas, concepts, that jump out with you “” things you agree with, disgaree with, find insightful. Stop the video when one of these happen. Jot yourself a note. My colleague at Virginia Tech Gardner Campbell calls these “nuggets”. You will be asked to share and expand on these as part of your weekly summaries (see below). I am not looking for a book report, just the sparks that got you thinking. It becomes less of an exercise to summarize an entire piece to identifying an interesting point within. A two minute clip of art critic Robert Hughes talking about “what art is” (thanks again Gardner for sharing this one). It’s hard for students, he sounds stuffy, but when they listen closely? Gems. The RSA Animate of Steven Johnson’s Where Good Ideas Come From is usually the favorite one, quite a few are amazed how Johnson can talk and draw at the same time ;-) (I clarify that for them in my comments). I am going to post some excerpts below to demonstrate how different and common the student responses are. I also note how many of them have an interest in this the drawing style, and I intend to invite Giulia Forsythe for a session on visual notetaking. A new one this time around, designer Kelli Anderson’s TEDxPhoenix talk on Disruptive Wonder. This one too was well received- she demonstrates an interesting approach to design. problem solving, and attention to detail. I would use this one again. 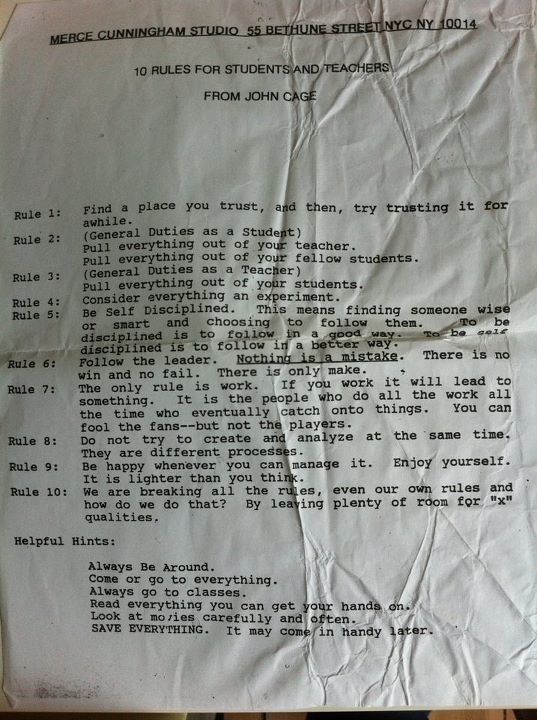 John Cage’s 10 Rules for Students and Teachers – it is a photo of a wrinkled piece of paper… and priceless. This video by Stephen Johnson is unlike anything I’ve ever seen before! I only have one word to describe my reaction too it: WOW. I was completely blown away by this video and Mr. Johnson’s drawing abilities with a dry-erase marker! I love how he said that ideas need time to develop and that they need to “mingle” and to be shared among others in order to grow and deepen. I completely agree with his point that the use of technology allows us to find our “missing pieces.” Social Media allows for people to work across states, nations, and even continents, through the use of a computer. Sharing ideas is all about expanding our knowledge and helping others with their goals. When Steven Johnson talked about how the internet has lead to a historical increase in connectivity and being able to more easilly connect with others to share ideas and colaborate I could not help but think about my ideas for the ds106 subreddit. I see the subreddit being used to connect with others involved in ds106 in order to better our work and to share ideas as ds106 evolves and changes. I see it as being a way to connect with a wider audience without being limited to 140 characters in a single message as we are on Twitter. My favorite video is the one by Steven Johnson. I think that he puts the process of ideas together in a really clear layout that people can understand. I like the concept of building upon other ideas and the emphasis that it is not just a “Eureka!” moment. The media he uses in the video is also very intriguing to me, with the drawing and the building up to the light bulb which is the representation of an idea. I would love to make a video like this using continuous drawing or whatever it’s called. The more I watch these videos the more excited I get about creating new media! As I was watched “Where Good Ideas Come From” the first time my mind was blown just watching him draw with the animations. It was so good by the time I started to listen to what the guy was talking about it was over. I love the fact that at the end he drew a light bulb I just thought it was genius. Therefore I watched it again without looking at it so I would not get distracted and there was some good information about innovation. I love how he made it easy to understand and the idea of how there is a lot of little things together makes an idea whole. I also like how he made an example of how the world wide web was invented from Tim Berners-Lee and how he scrapped his own idea and started to think little by little and gave it time to fertilize until the world wide web was actually invented. Steven Johnson has a point that I think some people lose sight of in this age of technology. Too many focus on how overstimulated we have become. Yet, for me, all these random connections with people and their ideas on the internet helps us create in ways we never could before. I know that not everyone uses the internet in the same way as I do, but I feel like when I’m browsing reddit or tumblr or even stumbleupon, I am absorbing all these different ways of doing things. Just like how reading helps you write better, I feel like viewing ideas and media on the internet helps you build your skills to create. My favorite video was from Steven Johnson called “Where Good Ideas Come From”. The first “nugget” I jotted down during this video was the way he presented the material; he draws out the story of what he is saying. I had to re-watch this video twice ““ once to get ideas and once just to observe the masterpiece that he draws and how he draws it. The RSA animate was of a similar vein”“I seriously love those animations, go check out the one on the education paradigm (link to follow, when I find it again. I have it downloaded on my computer but not bookmarked). Anyways, RSA talked about where ideas can come from, but the style of delivery is what makes RSA my favourite. It’s engaging and energetic and kind of wacky, and keeps you really, really invested”“me at least. The Stephen Johnson video was one of the most entertaining and creative videos I had even seen. It was so creative that I just sat at my computer for about five minutes trying to come up with a good word to describe it (which I clearly couldn’t since I stuck with creative, I thought about going with mind-blowing for a while though). After getting about half way though this video the first time I realized that I had not really been listening to what he was talking about because I was just constantly waiting to see what he was going to draw next. I ended up watching this three times and decided that I’d like him to come and teach all of my classes. The second video on creativity was also interesting. I disagreed with his idea that the Internet stifles creativity, and going along with his idea that it takes large groups of people and connection to incubate ideas, the Internet should be the ultimate place for ideas to occur because of the limitless connection and incredibly large quantities of people using it. Of course, this requires knowing where to look, which would also be very challenging. But enough ranting and on to the part that really matters: nuggets. My first “nugget” that came to me was in the Steven Johnson clip. The entire idea behind the video (from what I understood) was a justification of both new media sites as well as the spread of ideas on a new platform. After watching the video I found the (possibly accidental) under lying meaning to be very interesting. For me this was a meaning of showing the internet and all of its platforms as a way to not just grow ideas but combine others to create a whole new understanding of just about anything. Whatever this idea shaping took form in, it was really interesting to stand back and look at this awe inspiring, man made venue in which time and place can no longer hinder both idea sharing and the creation of new ones. Steven Johnson’s video about where creativity comes from didn’t really “inspire” me in many ways but it did give me a new appreciation and understanding (or rather, a “˜renewed’) for the potential of this class. I took a course freshman year (which was a while ago ““ I’m a fifth-year senior) entitled “Mash-up and Remix: The Future of Creativity in Cyberspace” which seems now like a precursor to this course in which I was introduced to a lot of these things like Creative Commons and the potential for the internet to be a meeting ground for millions of different ideas that other people can interact with and add on to to create new things. I then spent the next four years reading and writing non-stop and forgot to appreciate the other things the internet can do. It was nice to be reminded. The following nugget of wisdom that I found was in Where Ideas Come From by Stephen Johnson. Let me start by saying that I love these sort of videos where they draw as they talk to further capture your attention. If I could do anything that could even remotely resemble that, I’d be amazed. But as far as the video itself goes, it caused me to create a stream of consciousness sort of note taking. The idea that captivated me above all was his opinion on how a great idea forms in the first. 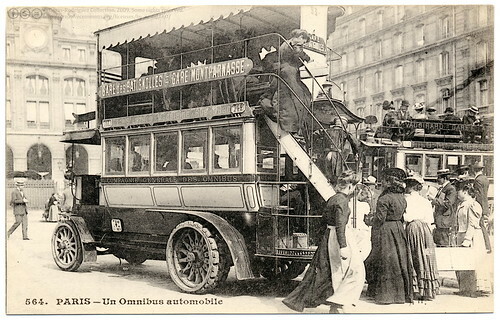 Although it would be nice to assume that many great ideas come from a Eureka! moment, more times than not, it happens through what Johnson calls “slow hunch”. I particularly liked how he noted the collisions of small hunches to eventually form the goal of the big idea. Though many times in history only one person is accredited with an idea, it goes not necessarily mean that they are the sole innovated. No, often it is the product of years of slow hunches and then there is an eventual driver that puts the pieces together. It is similar to a movie. Often, you see Leonardo Dicaprio, or Denzel Washington getting their awards for their phenomenal job as an actor but subsequently, it was the effort of many various others, come the results! Just my two-cents though. Looking at the video of where good ideas come from I am instantly appreciating how people need to work together to get something powerful. Collaboration is key and just from week one of bootcamp I can tell that I am going to be relying greatly on my fellow ds106ers (or noble steeds as I like to call them) for not only help, but inspiration for the various assignments. Between this video and this class, I already have been opened to a whole new world where people really are just looking out for each other and are willing to help in a second. While I personally am not the biggest people person (a quality this princess needs to work on) I can certainly tell that I am going to have to be willing to reach out to succeed in this classroom environment.